Physicians from many specialties are prescribing exercise for health conditions such as: obesity, heart disease, elevated cholesterol, stress, high blood pressure and musculoskeletal disorders such as arthritis and osteoporosis. The population who have not been active begin to move and can experience new aches and pains that are unfamiliar while the healthier groups may reinjure or damage a weakened area. New activities, strenuous movements, repetitive motion and wear and tear can result in painful joints and other musculoskeletal injuries. Stress on our joints can lead to osteoarthritis resulting in significant pain as a lack of healthy cartilage and joint fluid cause bone to rub on bone at the joint surfaces. As the population ages, osteoarthritis is a more common issue. Many orthopedic and musculoskeletal injuries can impede the goals to maintain this sought after active lifestyle. Physicians aim to manage patients’ injuries so that they can maintain mobility and participate in the activities that they enjoy for as long as possible. MSK Ultrasound has become extremely popular not just for diagnostic imaging of musculoskeltal structures, but the application of ultrasound in pain medicine is a rapidly growing imaging modality in interventional pain management. Ultrasound guided injections are becoming routine for many clinicians in sports medicine, rheumatology, pain management, and orthopedics. Using a portable ultrasound machine that captures fine detail is paramount in improving patient results. If you're considering adding diagnostic ultrasound to your pain management practice, read on for the benefits of this imaging modality. 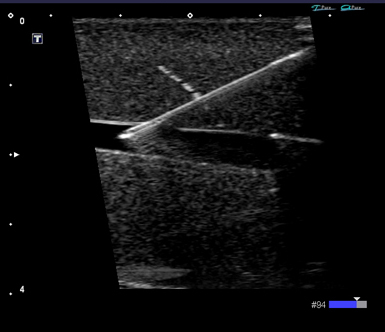 Learn more about using ultrasound guidance for joint injections!